​WHAT IS THE RAINMAKER EFFECT? ​The Rainmaker Effect is a non-profit entity founded on the premise that true success comes from enabling and empowering others to succeed. We believe that true life success comes from working with others to accomplish a greater good. We exercise this belief by helping youth and young adult groups accomplish a “greater good” in their communities by guiding them through a structured, repeatable process focused on making a positive community impact. We start by defining a purpose and a big idea, and then guide the group through teaming with others to succeed. Rainmaker Effect's mission is “empowering and equipping youth and young adults with the skills, knowledge and tools to become servant leaders in their communities”. Along with this purpose, we are also building and inspiring an ever-expanding network of mentors and we are equipping them with the skills, tools and resources to make positive impacts on their communities while freely sharing their wisdom with mentees. ​The Rainmaker Effect is based on tried and true principals that produce positive results every time. “The Rainmaker Effect” occurs when a program participant who has received mentoring and support through a Rainmaker Effect program develops their role beyond that of solely a mentee into that of a mentor thus completing the circle of mentoring. This continuous “completing of the circle” multiplies the impact of "the Rainmaker Effect”. The Rainmaker Effect (TRE) employs a proven method of immersive, real world group mentoring where mentees are guided through a four step process enabling and empowering them through a process of “Reaching Outwards for Outrageous Team Success (ROOTS). The program involves weekly on-site team mentoring sessions over a three to four month period. 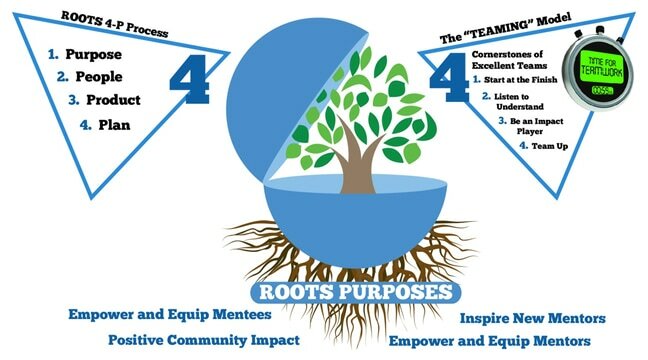 The more robust the ROOTS, the more long-term impact the mentee team members will have in their communities. TRE’s purpose is powered through a four step mentoring process life cycle involving Purpose, People, Product and Plan. Add them up and you get 1+2+3+4 = Perfect 10 Results, every time. As well, a 4 part teaming model is employed to maximize team and individual success. The teaming model consists of four basic components. We need your help to grow our impact. This includes identifying groups in need of help and extending our team of servant leaders. Please contact us to find out how.